If you believe that criminal charges are about to be filed against you, it is always to your benefit to speak with a reputable criminal defense attorney. Even if criminal charges never get filed by the investigating agency or the prosecutor’s office, you will benefit immensely from the advice and guidance of a skilled defense lawyer. Your initial contact with the police or investigating agency can have a dramatic and lasting impact on the outcome of your case. Be prepared. Having a reputable and skilled criminal defense attorney at your side from a case’s inception is of vital importance. Do not let expert detectives and interrogators question you without the safeguard of qualified counsel. Even if you feel that you have no exposure to criminal prosecution, it is critical to protect yourself if you are the suspect or a target of an investigation. Often times, your criminal defense attorney can review your case and discover evidence or mitigating factors that may be used to your advantage before charges are filed. After carefully screening your case, your lawyer may be able to present substantial evidence or mitigation to prosecutors that will dramatically effect how your case is charged. A skilled and qualified criminal defense lawyer may be able to dissuade the prosecutor from seeking a felony indictment or even charging a suspect at all. Additionally, it is important to know that once an investigating agency and/or the prosecutors decide to file criminal charges against you, your charges will appear on your criminal record, even if the charges are later dropped or dismissed. The information contained within your criminal record is accessible to the general public, your future employers and landlords. For this reason, it is imperative that you do everything possible to intervene immediately. By working with a criminal defense attorney, you may be able to prevent your charges from being filed from the very beginning. You cannot afford to wait and risk your future well being! 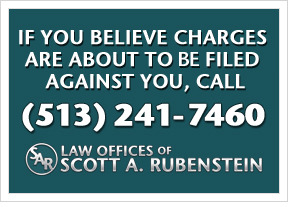 If you believe you are about to be charged with a serious criminal offense, do not hesitate to call The Law Offices of Scott A. Rubenstein at (513) 241-7460. He can evaluate your case and advise you of your legal options.